If you’ve raced around Nashville in the past couple of years, you’ve probably seen a flash of NRC Race Team member Joey Elsakr. He’s super fast, is as smart as he is fast (hello, Ph.D/MD candidate), and is one of the nicest dudes around. 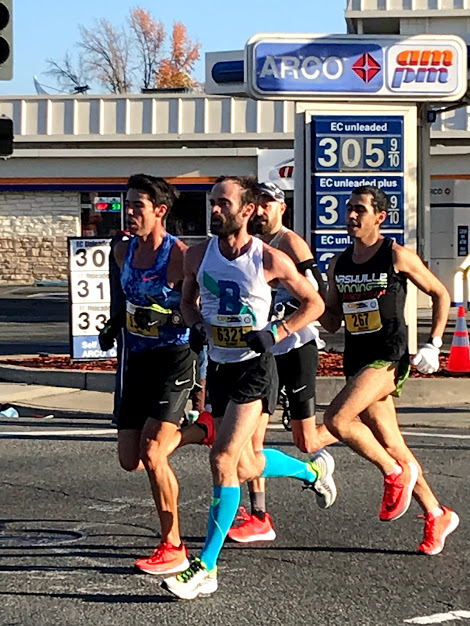 As he gears up for Spring races, he’ll be doing weekly columns for the blog which will chronicle his training as well as coaching tips and thoughts. BUT FIRST, let’s get to know Joey more and hear about his latest marathon. . . California International Marathon in December. NRC: How long have you been running -- did you grow up with it, find it in high school, etc? Joey: I’d say I found it just before high school. Sometime during middle school, my best friend and neighbor got me to go running with him and his dad, who was a runner. I was not unathletic and had jogged a mile or so before. We did 4 miles that day, and I thought I was gonna die. Then this turned into a semi-regular occurrence, then the same friend convinced me to come out to a cross country practice “just to try it”, and the rest is pretty much history. So, I kind of owe my intro to running to my friend and his dad (and my mom, who also ran a little at the time). I was big into tennis back then, so I did XC and tennis for a couple years and then quit tennis to focus on running and run track. To answer the question how long I’ve been running, I’d say since 2005ish, but I got more serious about it and started putting in more significant mileage around 2009. So about a decade ish. NRC: You ran at the collegiate level. What are some PRs, highs and lows of this experience? NRC: You’ve continued a stellar post-collegiate running career (while also working on a Ph.D/MD) – what has that been like? How do you balance training with rigors of school? Joey: There have been times, like during clinical rotations in the second year of med school, where running had to take a back seat and I got fat and out of shape. But in general, it’s been manageable. I’ve been working on my PhD the last 3.5 years, which is basically just working on a big project in a lab. It’s busy, but the hours are more regular and semi-flexible, so it isn’t too bad balancing training with that. Once I go back to med school to finish the MD, things could get crazy again. So I really want to accomplish my ultimate goal of qualifying for the Olympic trials in the marathon before that happens. NRC: Speaking of Olympic trials and marathons, you recently completed CIM. What was training like? How did that go? Are you happy with the outcome? Joey: CIM this past December, and the buildup leading up to it, will probably always hold a special place in my heart. As of Summer 2018, I had only run 1 PR in any distance for the previous 2.5 years. That PR was at CIM in 2016, and was a PR by only 15 seconds (2:23:17). I felt like I had been training reasonably hard and stayed mostly healthy, but hadn’t really seen significant improvements in a while. The Olympic trials standard is 2:19:00, so I had (and have) a lot of work to do to get there. So I decided to make some changes. The first one was that I started working with Scott Wietecha. My previous coach was good, undoubtedly, but I felt like I need a change almost just to introduce some “newness”. I was talking to a couple people and thought about self-coaching, but really liked Scott’s approach so decided to go with him. The next change was to get my running life back in order. My hamstring had been tight/weak for a long time and wasn’t getting better. I went to a sports medicine doctor who knows a lot about running and start doing physical therapy at Vanderbilt. I now do physical therapy exercises almost daily. I also got more serious about recovery. At least 8 hours of sleep every night, got more regular with my stretching, and had a recovery drink (usually chocolate milk) after every hard or long effort. I had done those things in the past, but not consistently enough. I knew I needed to be more serious. All the above combined to make a pretty healthy, successful season. I was able to consistently put in >90 miles per week and got some really solid marathon workouts in. The best one was a 20 mile progression in uncomfortably cold weather, with 16/20 miles solo. It was also at the end of a 101 mile week and my legs were tired before starting. I went through some mental battles during the workout and thought seriously about quitting but stuck it out and ended up averaging 5:32 pace for the whole thing, with the last two miles in 10:24. After that, I felt so prepared for the marathon, and it really gave me confidence I could run a big PR. The race itself was really just the cherry on top. I ran 2:21:51, which was an 86 second PR. I’d say it was a pretty well executed race, but maybe a little more patience early on and I could’ve run 30 seconds faster. Still, it was a race to remember and it’s great to feel like I’m back on track again and improving. Since this answer is getting ridiculously long, I’ll refer the interested reader to my race report on Strava for more details. I still have a long way to go to qualify for the trials (2 min and 51 seconds, to be exact), but I feel like I’ve got some momentum behind me now and though it’s improbable, it’s not impossible! NRC: Are you training for anything now? Joey: Yes! I’ll be running another marathon in the late spring and hopefully attempting to dip under 2:19. I’m 90% sure it’ll be Grandma’s, but I haven’t committed yet. In a couple weeks I’ll know more about my academic future, so I’ll probably decide for sure then. Training is fully underway for a spring marathon though. I’ll also be doing the Wrightsville Beach Half Marathon on March 9th. NRC: Stay tuned for more on Joey’s training and be on the lookout for Coach Joey’s Corner coming at you weekly!